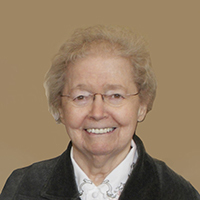 Sister Marianne Misetich (Sister Mary Antonetta), age 89, died at the Marie-Rose Center at Mary’s Woods at Marylhurst in Lake Oswego, December 3, 2017. A member of the Sisters of the Holy Names for 70 years, her funeral will be held at 11 a.m., December 14, 2017, in the Chapel of the Holy Names, Lake Oswego, Oregon. Of Croatian descent, Marianne was the daughter of Anthony and Eva Lautz Misetich. She grew up in Portland in a loving family that she deeply treasured all her life. Following her graduation from St. Mary’s Academy in 1945, she entered the Sisters of the Holy Names and received the name Sister Mary Antonetta. She taught music in Holy Names schools around the Northwest, including Salem, Bend, The Dalles, Seattle, Spokane, Coos Bay, Portland, Astoria, and St. Paul. During this time she completed a Bachelor of Music at Marylhurst College. Later she was music director in parishes in Gresham, Portland, and Tillamook, was a radio announcer with Portland’s Catholic radio station, and ran a music ministry at the Sisters’ Motherhouse in Montreal, Quebec. Of late, she enjoyed retirement at Mary’s Woods. Sister Marianne always brought a sense of festivity to any gathering. She was a captivating storyteller and shared her musical talents abundantly. Her spirit might be captured in the word “Ljubimo,” the Croatian word for “let us love” that she chose for the name of the record album which featured twelve of her original compositions. A talented composer, her songs are published by Oregon Catholic Press in their annual music issue and available on their website. In her years as a music teacher, she was well known for her original music written for school programs and plays. Song lyrics from her “Ljubimo” album provide a glimpse into her personal philosophy. In “I’ll be There?” she wrote, “I know he is calling to me to serve him unconditionally. I’ll be there.” and in “What is the Meaning of Life?” she wrote, “How much can someone dream? How long? Forever!” Throughout her life, Sister Marianne lived these words unreservedly. Sister Marianne is survived by her sisters Margaret Hill and Elizabeth Curtin, her nieces and nephews, and the members of her religious community. Remembrances may be made to Sisters of the Holy Names, P.O. Box 398, Marylhurst, OR 97036 or online at www.snjmusontario.org/donate.